You'll explore and learn at Museum of Fine Arts and John F. Kennedy Presidential Museum & Library. Get in touch with nature at Dolphin & Whale Watching and Walden Pond State Reservation. Take a break from Boston with a short trip to Orchard House in Concord, about 40 minutes away. The adventure continues: appreciate the extensive heritage of Freedom Trail, stroll the grounds of Mount Auburn Cemetery, and explore and take pictures at Fenway Park. For maps, where to stay, and tourist information, read Boston trip maker tool . Winnipeg, Canada to Boston is an approximately 9.5-hour flight. You can also drive. Traveling from Winnipeg to Boston, you'll lose 1 hour due to the time zone difference. In May, plan for daily highs up to 22°C, and evening lows to 11°C. Wrap up your sightseeing on the 28th (Tue) to allow time to take a bus to Sandwich. Sandwich is a town in Barnstable County, Massachusetts, United States. Kick off your visit on the 29th (Wed): engage your brain at Sandwich Glass Museum, see the interesting displays at Heritage Museums & Gardens, then stroll through Shining Sea Bikeway, and finally contemplate the waterfront views at Cape Cod Canal. To find where to stay, reviews, traveler tips, and tourist information, refer to the Sandwich holiday planning site . Take a bus from Boston to Sandwich in an hour. Alternatively, you can drive. Expect a daytime high around 21°C in May, and nighttime lows around 9°C. Wrap up your sightseeing on the 29th (Wed) to allow time to drive to Newport. Start off your visit on the 30th (Thu): enjoy the sea views from Beavertail Lighthouse and Park, then take a memorable drive along Ocean Drive Historic District, and then explore and take pictures at Cliff Walk. For other places to visit, traveler tips, more things to do, and more tourist information, read our Newport trip planner . You can drive from Sandwich to Newport in 1.5 hours. Other options are to take a bus; or do a combination of bus and train. In May, daytime highs in Newport are 21°C, while nighttime lows are 11°C. Finish up your sightseeing early on the 30th (Thu) so you can go by car to Ogunquit. Kick off your visit on the 31st (Fri): explore and take pictures at Perkins Cove, then get to know the fascinating history of Marginal Way Walkway, and then enjoy the sand and surf at Ogunquit Beach. 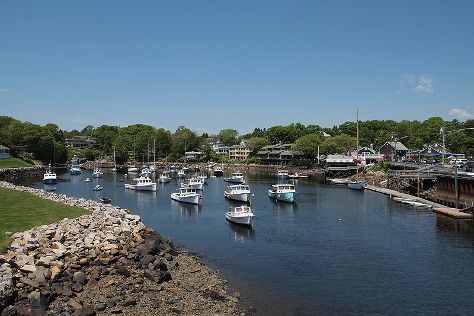 To see photos, other places to visit, traveler tips, and other tourist information, refer to the Ogunquit trip itinerary planner . You can drive from Newport to Ogunquit in 3 hours. Other options are to take a bus; or do a combination of bus and train. Traveling from Newport in May, you can expect nighttime temperatures to be a bit cooler in Ogunquit, with lows of 7°C. Cap off your sightseeing on the 31st (Fri) early enough to go by car to Bar Harbor. Bar Harbor is a town on Mount Desert Island in Hancock County, Maine, United States. For photos, reviews, and other tourist information, read our Bar Harbor online trip itinerary maker . Traveling by car from Ogunquit to Bar Harbor takes 4 hours. Alternatively, you can do a combination of bus and flight; or do a combination of bus, flight, and car. When traveling from Ogunquit in May, plan for little chillier days in Bar Harbor, with highs around 18°C, while nights are about the same with lows around 7°C. Wrap up your sightseeing by early afternoon on the 1st (Sat) to allow time for travel back home.